The golf swing techniques of the masters and other successful golfers can be related to a logical underlying concept in which relatively simple but non-obvious actions of the arms, wrists and hands combine with appropriate body rotation for proper control of a golf club on an ideal swing plane as explained in detail at A logical Golf Swing Concept and illustrated in the videos below. 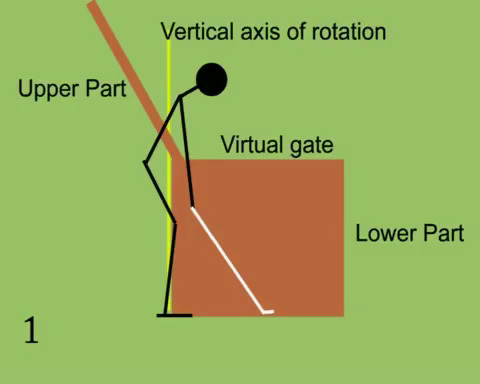 In this golf swing concept there are upper and lower parts related to a vertical axis of rotation. The vertical axis of rotation (which corresponds to the centre of gravity) passes up from between the ankles through the front of the lower body and the upper back behind the shoulders. In the lower part the actions of the hands and the club are contained within a virtual gate which is hinged to the vertical axis of rotation. In the upper part the forearms, wrists, hands and the club are unified into a particular cocked wrist relationship which is maintained throughout the upswing and downswing such that the club head's swing track relates closely to a naturally inclined swing plane. Use the play/pause and slider buttons to manipulate the action in the videos. 8. End of the "Sweep-thru-impact"
Elite players may appear to be quite different in their techniques. However that difference is only in the takeaway-upswing-downswing phases. With few exceptions the masters are the same, where it counts, when sweeping the club through impact in the lower part of the swing as shown in the following video comparison of some present day masters. 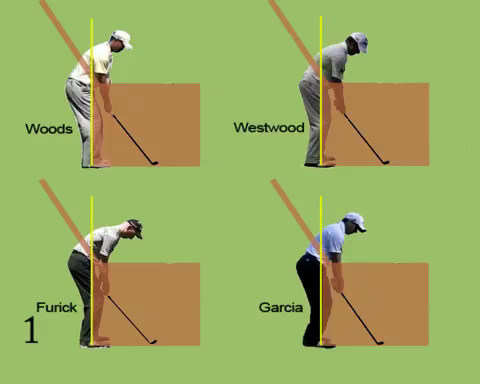 The Woods and Westwood actions are close to the concept model swing plane; in both upswing and downswing; whereas both Furick and Garcia have close to vertical upswings followed by particular compensating actions in their downswings. Furick also manipulates a closed club face in the upswing to neutral at the start of the "sweep-thru-impact". Moving the button through 6 to 8 clearly illustrates the sameness of the "sweep-thru-impact" actions. Appropriate setting of the wrists, with their associated cocking and uncocking action, is vital to directing the club onto the proper downswing plane and through the transition from the upper to the lower phases into a free-wheeling sweep-thru-impact. Maintaining a flat left wrist throughout the golf swing is generally claimed to be essential. That claim is not based on any biomechanical or dynamic principles but rather on a misconception that the wrist cocking action associated with the maintenance of a flat left wrist, in its particular alignment with that forearm, is ideal such that it ought to be a fundamental requirement in golf swing technique. Left wrist flattening at the top of the backswing can be observed in the techniques of a large percentage of elite golfers. However; at the start of the lower swing phase (sweep-thru-impact) their wrists, hands and the club are generally seen to be in a typical “Vardon” neutral setting while passing close in to the lower body as illustrated in the following image showing a golfer’s down view of their own action. The club shaft is parallel to the target line which puts the club head on the swing plane. Note the backward hinging of the left wrist being the same as would have been at the address set-up. Much emphasis is also placed on a claim that the left wrist should be flat or forwardly bowed at impact. The outcome of a golf shot is determined by the way in which the actions of the arms, wrists and hands control the club throughout the swing; particularly in the lower "sweep-thru-impact" phase; in combination with balanced body rotation around a stabilised vertical axis.